The new Ymmyarns 50 gram balls are here and they are gorgeous. I took a photo after I had them organized and now they are safe in their boxes. Beautiful yarns are so appealing, so full of promise for future plans. 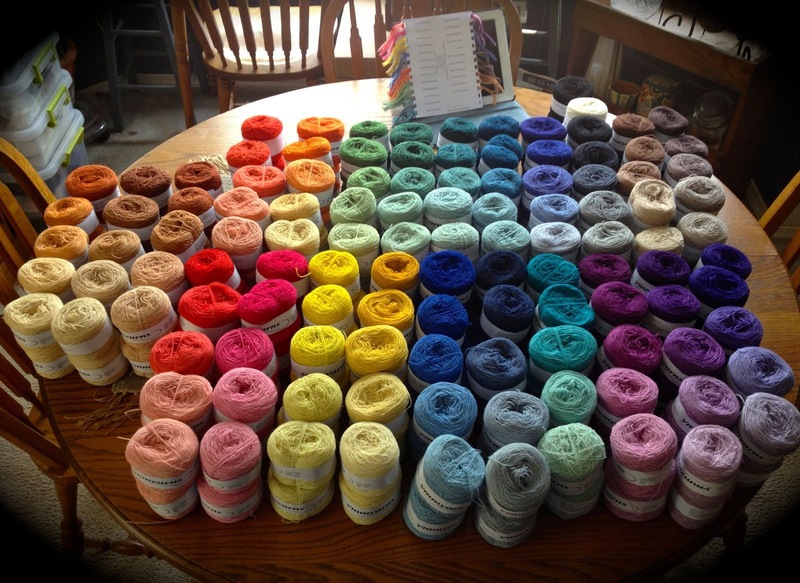 Having the entire color range in the 50 gram balls is a sign that Fiber Studio Tapestry and Bead Weaving supplies is growing. 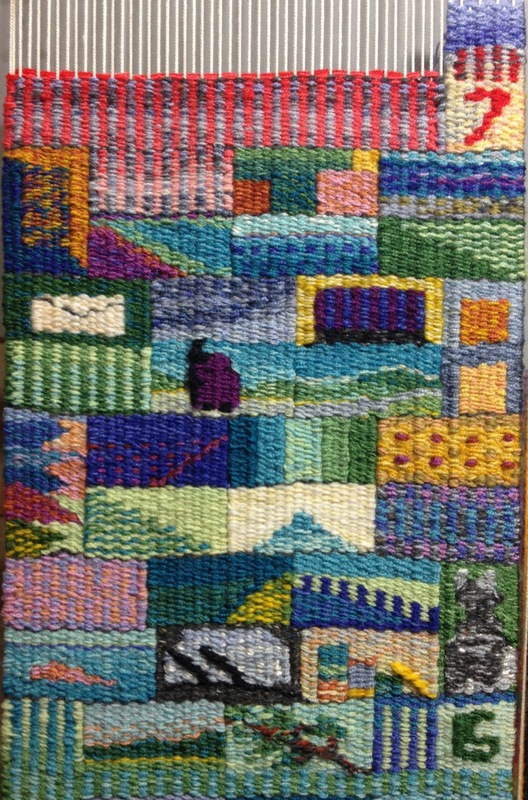 A special thanks to all the tapestry weavers that have purchased Ymmyarns from me. 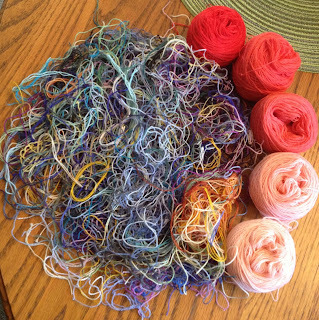 It is because of you that I have this lovely stash of tapestry yarns and I do not think they will be here long enough for me to become attached. In preparing some pictures of the Mango Hunters for todays post I began to reflect on how helpful having photos of my work, finished and in progress is to the process of making things. It is not only a way to admire my work or to show off the new "children" to friends and acquaintances and it is not just for the professional purposes of having images to send to shows or competitions. When I am feeling unproductive I often look at the photos from the previous months and manage to convince myself that I am accomplishing something, but I also use the photos as a tool to help with my working process. 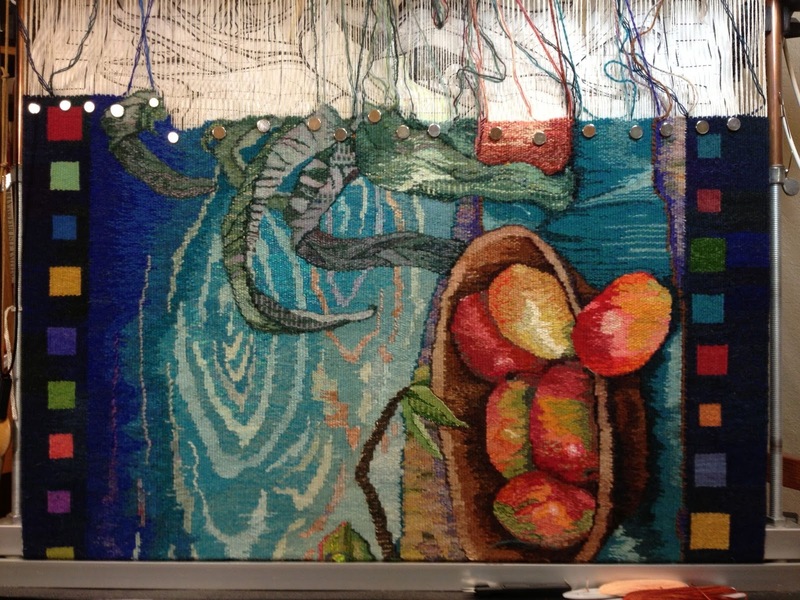 Here is a photo of the Mango Hunters as it appeared on the loom this morning. 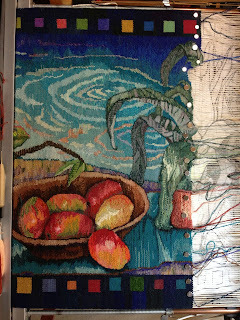 I am really getting excited as it seems this may meet my goal of being finished by the end of the year. 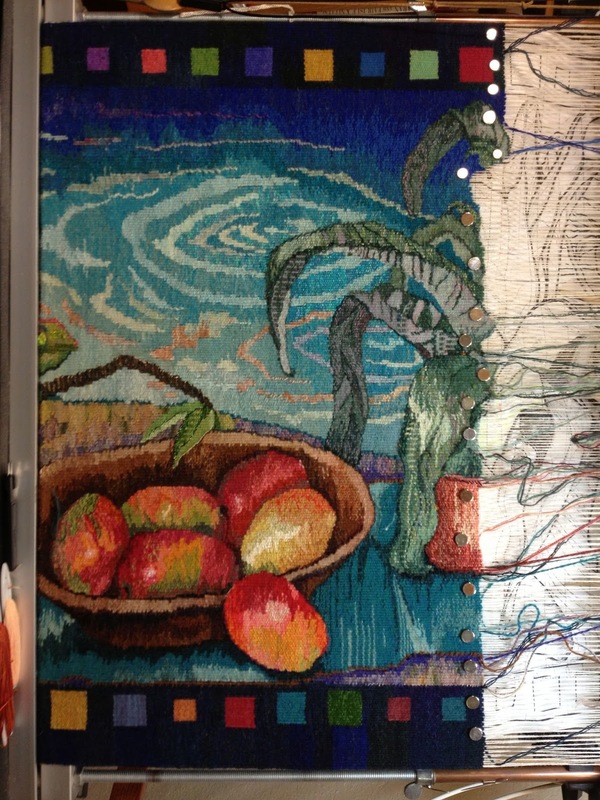 I often find that looking at a photo gives me a very different perspective than looking at the actual tapestry does. 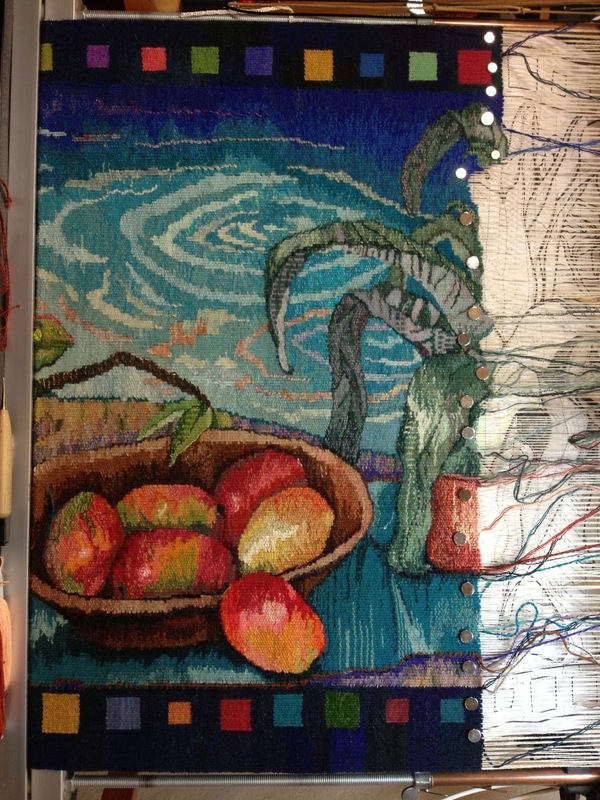 Condensing the image and removing yourself from the physical presence of the work can help to see details that are more difficult to catch otherwise. 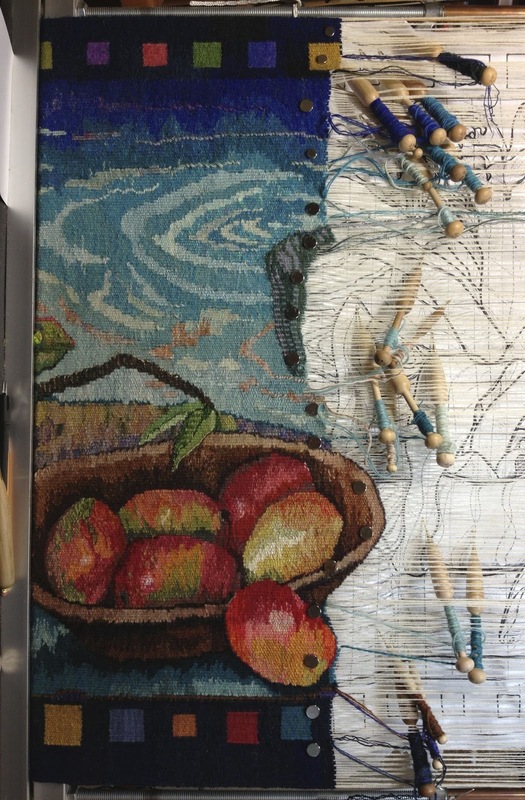 Especially in tapestry where parts of the work are no longer in view it can be a way of checking the continuity of the work as well. Since the Mango Hunters is woven from side to side one of the things that is helpful is just to rotate the photo and get a good at it from the proper perspective. 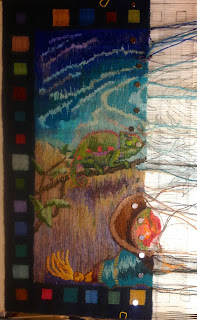 I see a couple of details in this one that I might want to change, but first I decide to go back and look at other views before each turning of the warp. To the right is a photo of the same scene a few weeks ago. This photo shows what it looked like before the last turn of the warp. here it is back at the very beginning. 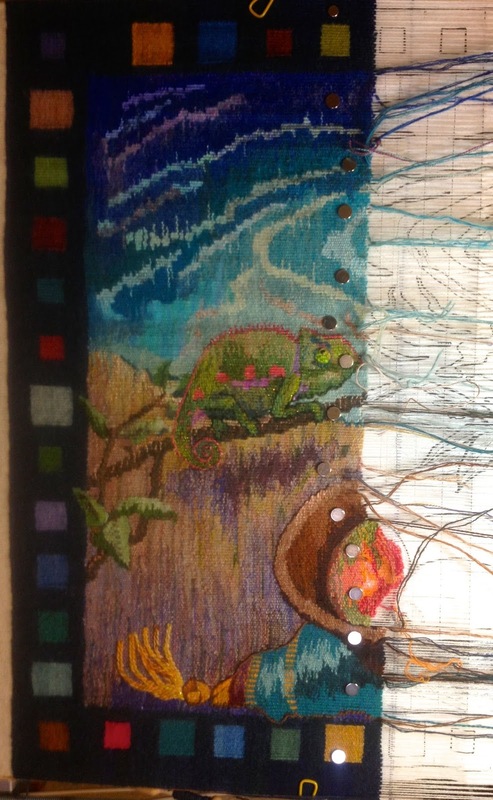 This photo is a little dark but it does help me to see how the design is progressing. This last photo is from just a few minutes ago. 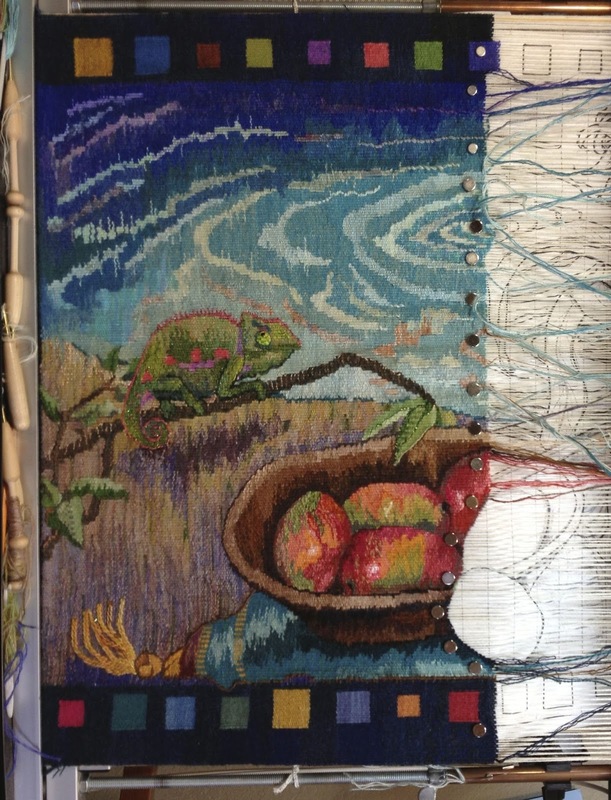 I have made some slight changes from the first one in the series based on what I saw from observing the photo and now I am ready to turn the warp again and move on. Now I see one or two small things I may change a bit but I think I will turn the warp first and so it goes. 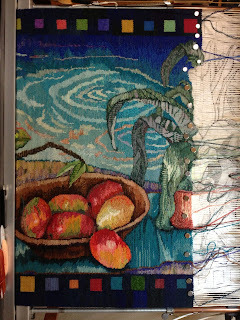 Half the Year in Tapestry and a start on July has me reflecting on the process of weaving everyday again. For this diary project it is not so much about just doing some weaving everyday but creating a small bit of weaving that actually has relevance to that day. What occurs to me is that this practice is a means to promote living in the present while preserving the past. 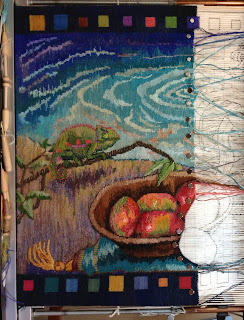 It is a daily challenge to find a symbol for the present, the past is already woven so it is "finished". I keep finding insights through this process all the time. Here is the month of June with a little transitional pick and pick and the first of July. 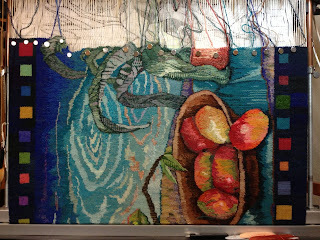 There were lots of memorable events in June, Fathers day, the Midwest Weavers conference and my 40th wedding anniversary! When I first started the year I was very aware of how using a 1 by 2 inch rectangle would limit the possibilities. Now I find myself thinking that I can't believe how many possibilities are lurking in that rectangle and this tapestry is set at 8 ends per inch. Some days have less sparkle than others of course and some symbols are better left unexplained but I was pretty happy with the Pineapple Upside-down cake I wove/baked the day before Father's Day. 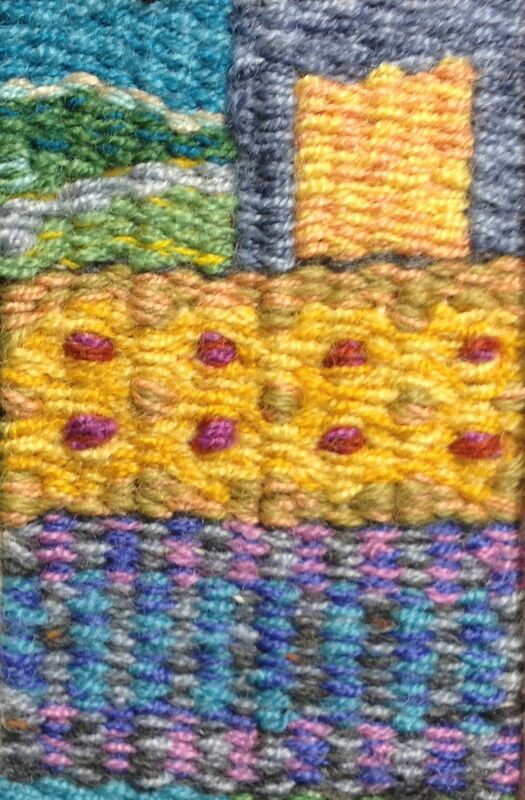 The woven version could have used a little more value contrast between the pineapple and the cake but I liked the weaverly approach I managed. The baked one was spot on and one of my husbands favorite desserts. To the right is a detail of the cake in the middle. The day before I left for the conference I wove my Spinner suitcase on the road, more of the road on traveling day, and then the up and down elevator for the first vending day. Then the stage where several events took place, and the Kansas storm rolling in on the day we returned home. I was happy to leave it behind as we drove into Oklahoma. 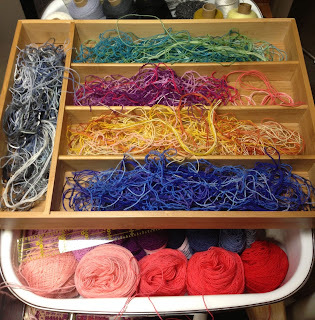 The last two days of the month I noticed the big pile of leftover wefts I had been accumulating and decided to do something about it so I wove the last two days of the month with them. That gave me an idea for July. 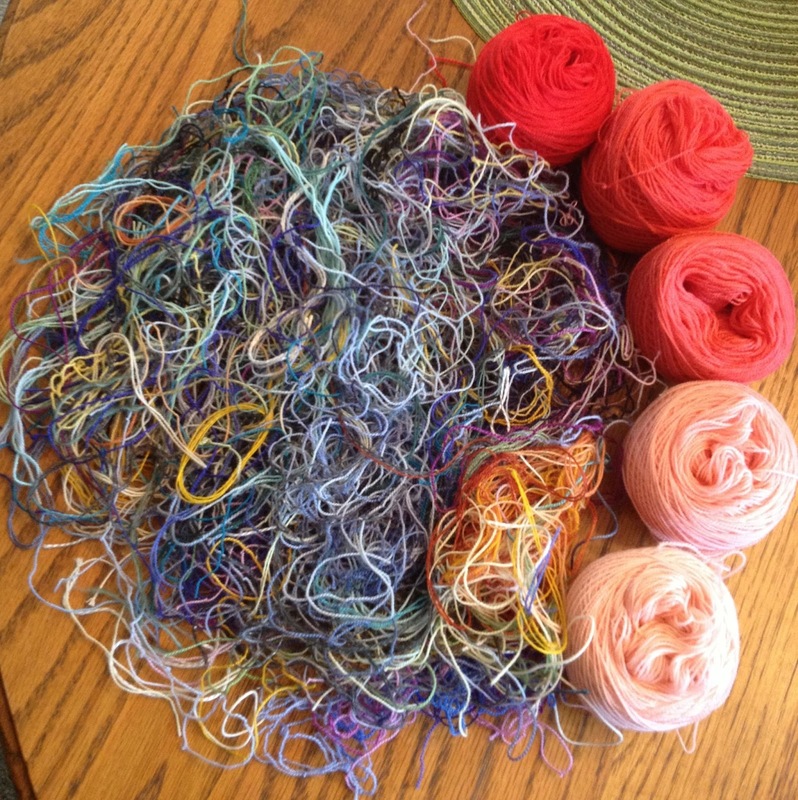 I decided to take my new color of the month which is a coral red range of Ymmyarns and use that and my pile of thrums for weaving July. Back at the beginning of the year I mentioned that one of my goals for this years diary was to become acquainted with my palette of Ymmyarns and that has been working nicely in this way. I suppose using these leftovers could seem way too thrifty but it is also an interesting challenge. After I spent some time organizing my piles of threads the project seemed more user friendly. I spent an evening organizing these and the thrums from the Mango Hunters. To the right is a detail of the last two days of June and some transitional pick and pick using the red range and mostly grey thrums. I must admit it was slow beginning and ending so many wefts for the pick and pick that goes across but I do like the effect. The smaller rectangles, like the first of July, should be easier to manage in this way. I should be posting on the Mango Hunters soon - almost ready to turn the warp again.